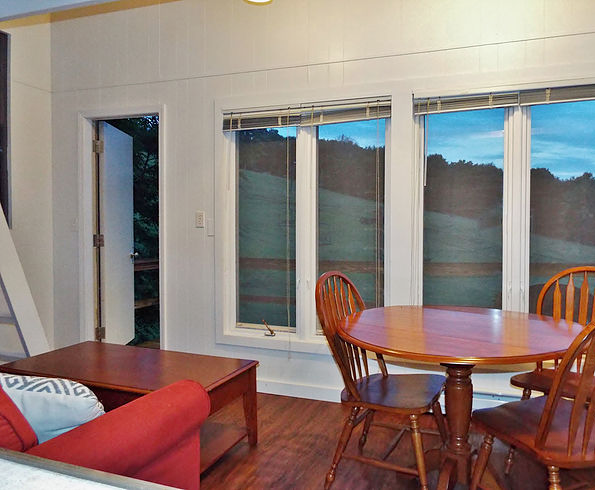 We are pleased to be able to offer premium, fully-furnished cabins in 2019! 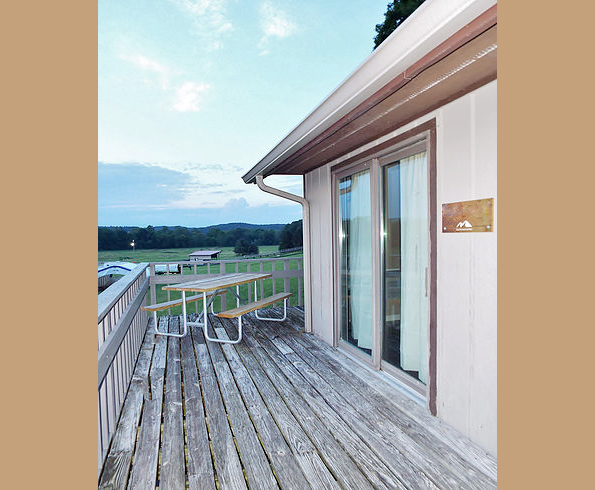 Cabins include A/C, concierge service, full bathrooms, and much more. Read the descriptions below for more info, or to reserve a cabin go to the ticketing page. Cabins are an add-on to your VIP ticket. You must purchase a VIP ticket to reserve a cabin. Only the person reserving the cabin must purchase VIP. People with GA tickets are allowed in the cabins. A refundable $200 deposit will be charged to your card at check in. This is in addition to the fees listed below. You can check in to your cabin on Thursday, Aug 8th. There is no additional charge for checking in on Thursday beyond the $25 per person fee for entry to the earlybird party. ​The Joker's Den is one of the lower level rooms located in the Triplex cabin at the festival. 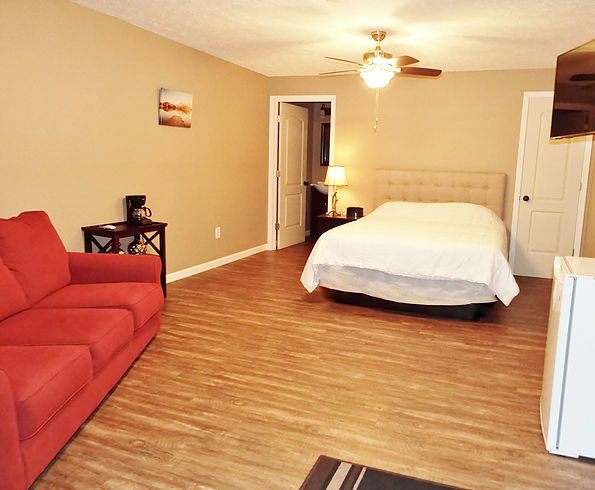 This room features one queen-size bed, and a pull out couch with full-size hide-away bed for additional guests. 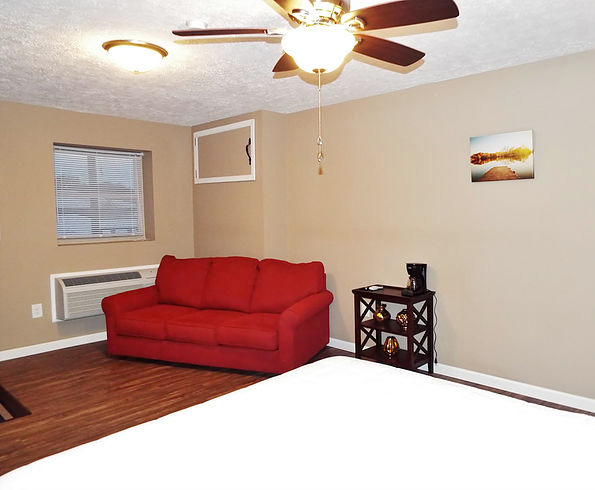 For your convenience, a microwave, mini-fridge, coffee maker and flat screen television are available for your usage. 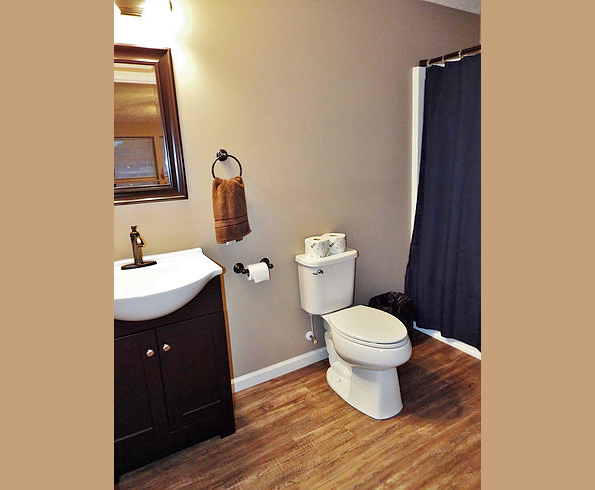 This room also features an updated full size bath. The Joker's Den shares a deck with one of the neighboring rooms in the tri-plex cabin and also features a picnic table area on the porch. Leviathan's Lair is located on the lower level of the Triplex cabin at the festival. 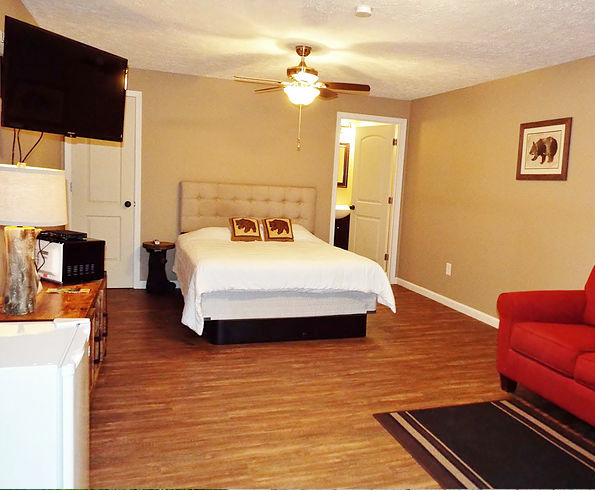 This room features one queen-size bed, and a pull out couch with full-size hide-away bed for additional guests. 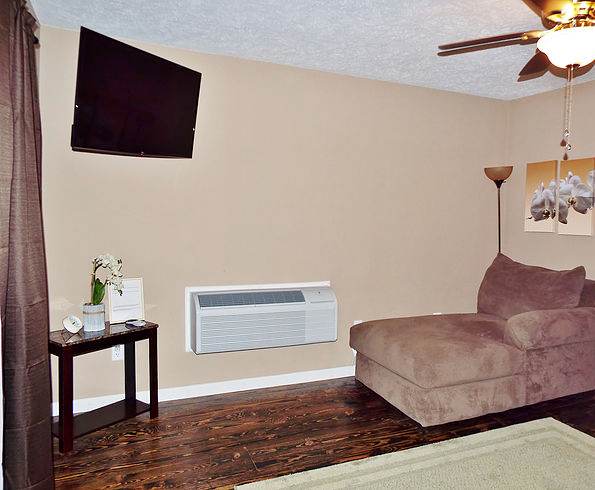 For your convenience, a microwave, mini-fridge, coffee maker and flat screen television are available for your usage. 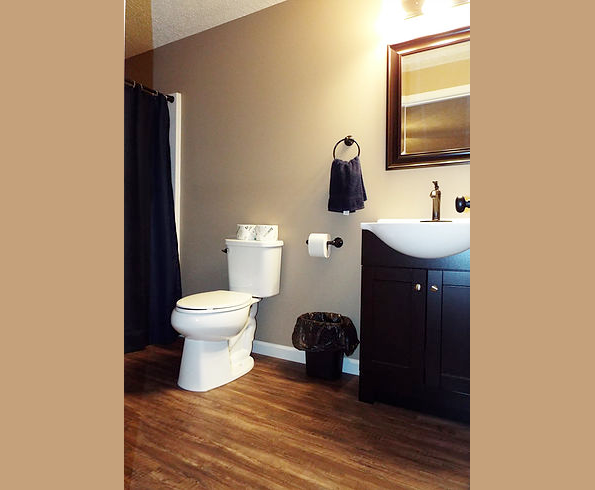 This room also features a modern updated full size bath. Leviathan's Lair shares a deck with one of the neighboring rooms in the tri-plex cabin, and features a picnic table area on the porch. The Watchtower is one of the more rustic cabins, featuring two queen-size beds and one full pull out couch suitable for additional guests. You'll enter The Watchtower on wooden steps leading up a dirt path. The Watchtower features large windows and nice size deck. 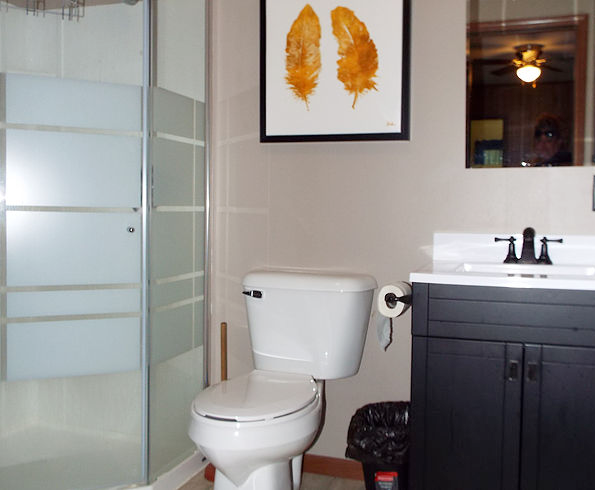 There is a single shower bathroom downstairs, and a step ladder takes you to the loft bedroom area upstairs. 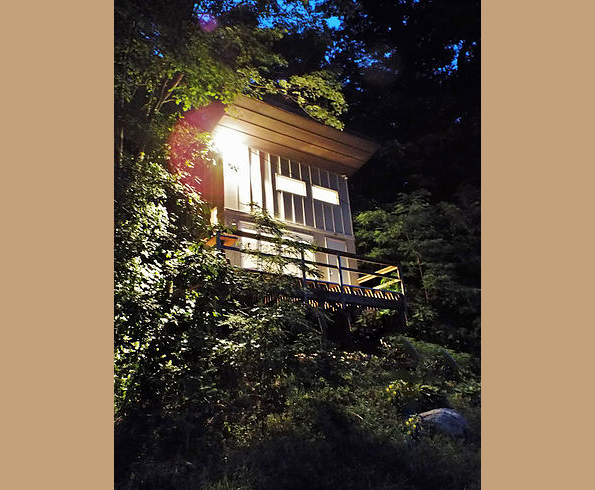 If you are looking for a true cabin feel, you will love The Watchtower! 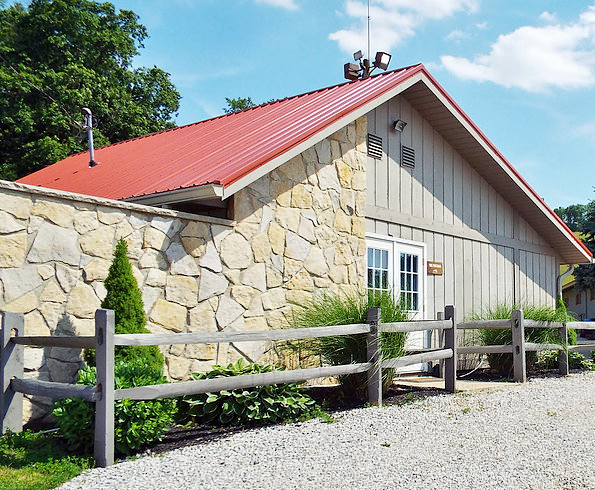 The Ringmaster's Quarters is a beautiful two bedroom, two bathroom cabin. It's perfect for larger groups seeking a more modern style updated cabin experience. 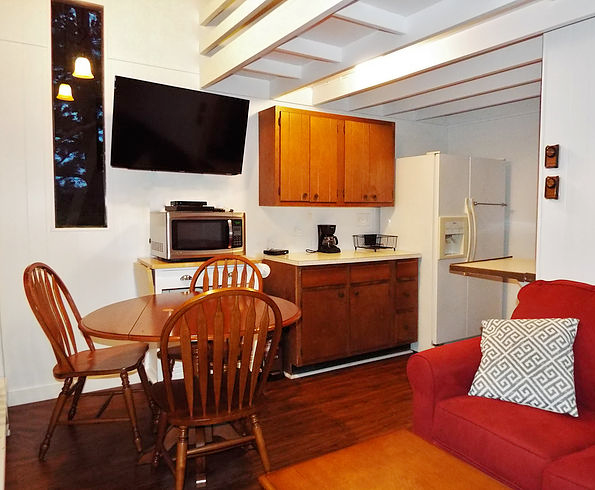 This cabin features a large kitchenette and a unique separation of rooms with bedrooms on each side of the cabin each with a full bath providing privacy and comfortability. 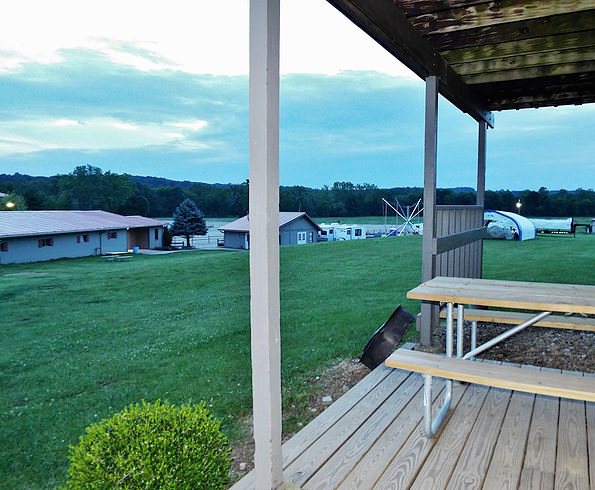 You will enjoy the expansive deck with picnic table overlooking the arena area of the festival, and the additional dining area will provide a nice space with plenty of extra room. If you are looking to enhance your Freakstomp experience without giving up the modern comforts you love, the Ringmaster's Quarters is the perfect choice! The Carousel House bunkhouse sleeps up to fourteen guests and features two updated baths with stand up shower and an additional storage room! 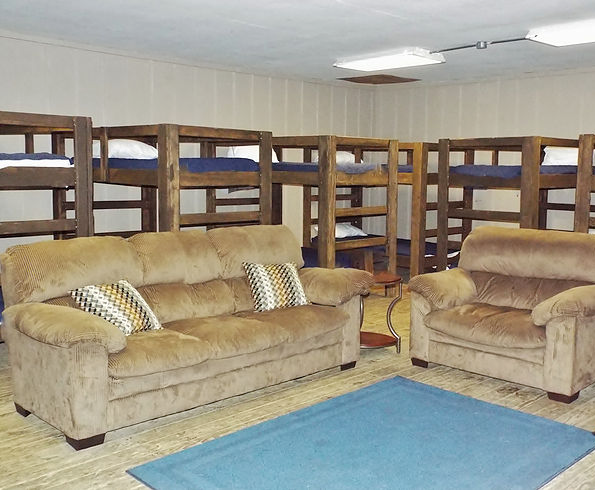 This bunkhouse offers a spacious walk- in area before coming into the bunkhouse through a charming rustic barn door entrance. You'll love the nice sized living area with flat screen television for your viewing pleasure and a mini-fridge and microwave for your convenience. 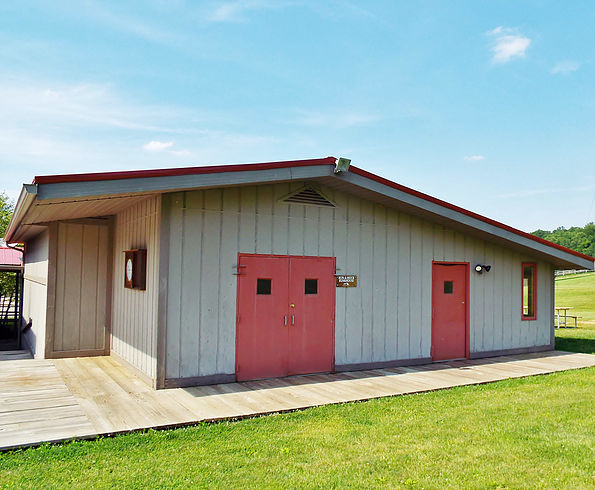 The Carousel House has a nice front patio area, and is perfect for large groups who want to stay together! 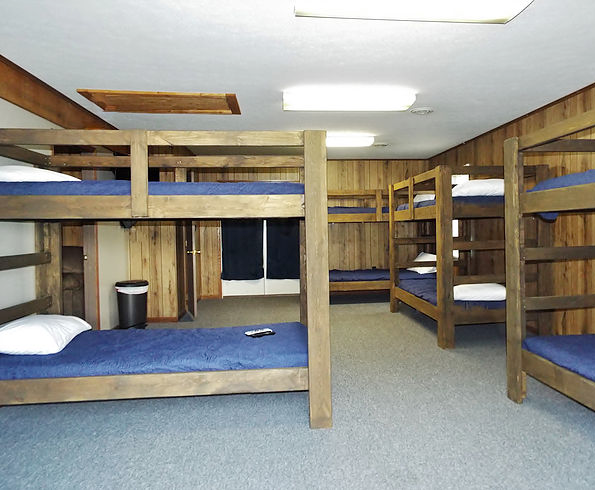 The Freak Manor bunkhouse sleeps up to fourteen guests, and features a separate bedroom with queen-size bed. 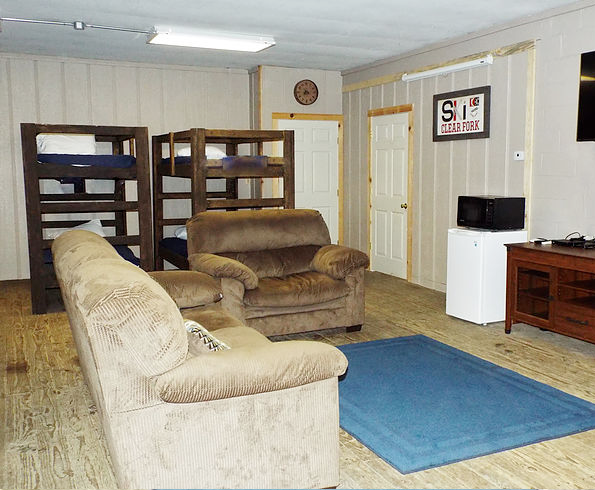 This bunkhouse offers an updated full bath and additional half bath in the bunk room for convenience. 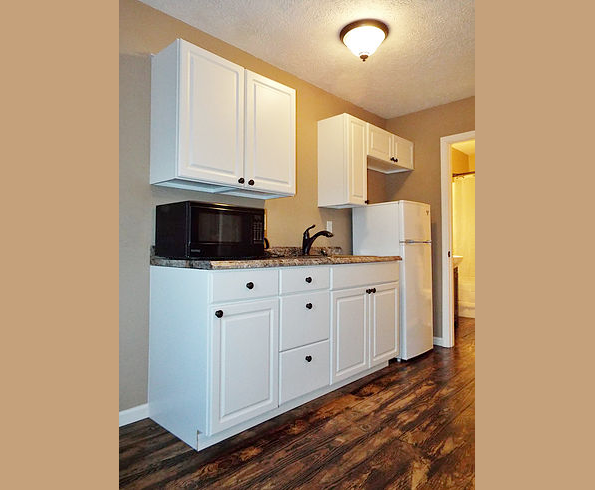 Additionally, there is a small seating area that features a mini-fridge and microwave, as well as an additional storage area. Freak Manor has a nice back patio area with picnic table, and is perfect for large groups who want to stay together!